Style 5102 is a sleeveless dress with a scoop neckline. 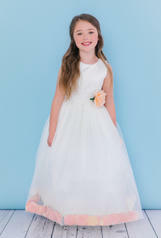 The tulle hemline is accented with silk rose petals. Cumber bund waist has a bow in the back, accented with a rose flower.�Satin buttons cover the zipper.